list). Stair turret to north-east with chamfered rectangular openings. lights with panelled tracery, moulded reveals, and returned hoodmould. Prince of Wales feathers and rose,and carved stops (left-hand missing). 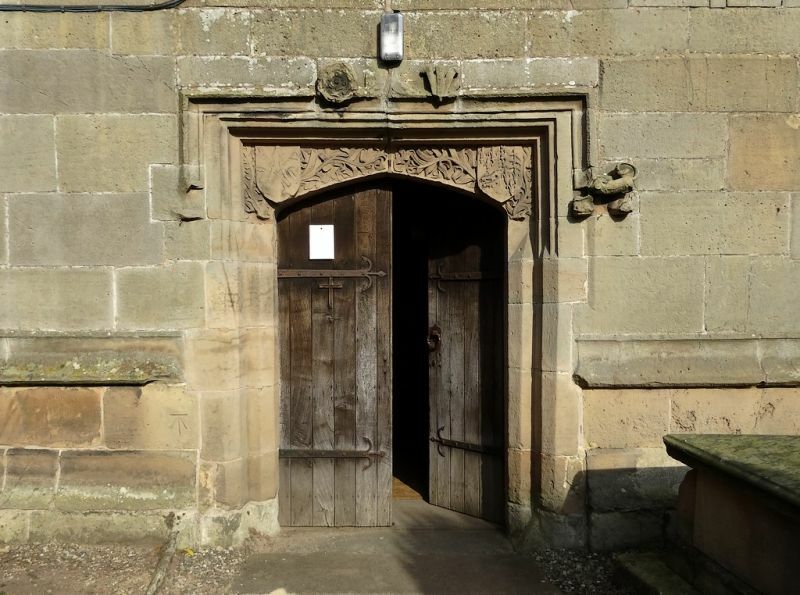 fragments of dressed and carved masonry; 4-panelled door to right. window to right of 2 trefoil-headed lights with double-chamfered reveals. 1778". Early C19 tablet on north wall to Thomas Ray (d. Oct. 27 1823). ends with coved coping and moulded kneelers, and cross at apex to west. V-struts, and 2 pairs of purlins, upper set with cusped wind braces. chancel arch. Hagioscope or squint between chancel and south aisle. borders and carved frieze; side panels with lozenges and rosettes. arcading, and semi-circular niche in each arch; wooden cover dated 1918. Corbet (d.1790) with drapery over, and elephant and castle above. recess with keystone and imposts and demi figure of the deceased. Archeological Journal, Vol. CXIII,, pp.221-2.